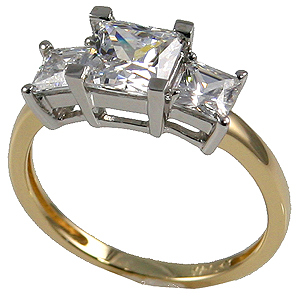 Stock #53518:14k Yellow Gold (2-tone) traditional Style, 3 stone Princess Cut Anniversary (past, present, future) ring... 2 or 3 Carat TW Russian Cubic Zirconia. Gorgeous, Top Quality, Russian CZs!!! Nice traditional style ring. Also available in Solid 14k Yellow or 14k White Gold. The 2 carat version has a 1 carat center w/ 1/2 carat sides. The 3 carat version has a 2 carat center w/ 1/2 carat sides.